At times a client might want to use an expired Gift Voucher to pay for their sale. If you are happy for them to do so, you will first need to change the Gift Voucher expiry date to be able to use the voucher in POS. Changing the Gift Voucher expiry date. To change the Gift Voucher expiry, search for any client and go to their client card. Once in a client card, click the Find Gift Voucher option on the top right. On the right side panel enter in the Voucher ID, and Find. The Gift Voucher details will display. The Gift Voucher Expiry: setting is down the bottom. 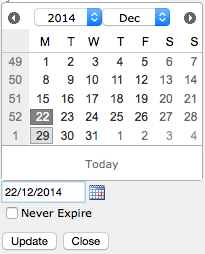 Use the calendar icon to choose a new expiry date, and click Update. Note: You also have the option to tick Never Expire. Done. The Gift Voucher can now be used to pay for the clients sale. Add the client back to POS and away you go. If you have any further questions please feel free to send them to us via the Submit a Request option in your Help & Support page.